Each year we pack a shoebox to ship to a child overseas that wouldn't otherwise receive anything special for Christmas. You can find out more about this through the organization Samaritan's Purse. 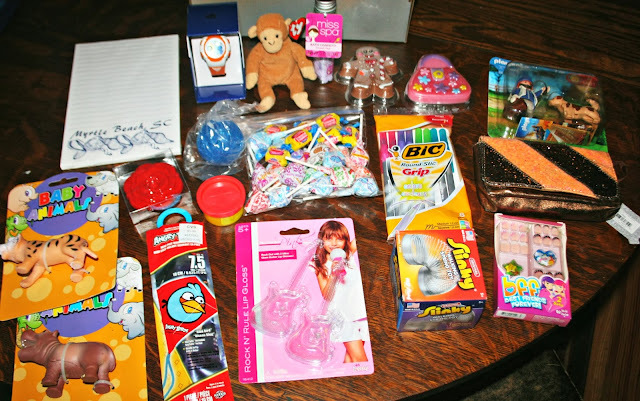 I look for little items all year round that might be just right to send to a child. I like to pick a girl each year, since I normally do all my shopping for little boys. But you know what happened this year? My boys complained. Did they complain about sending toys to another child? Oh no. Not at all. They complained that we were sending toys to a girl. They wanted to shop for a boy! I guess my girl shopping days are over. Either that - or next year we are just going to have to do two boxes! How about you, readers? Do you like to shop for disadvantaged children over the holidays? The boys will really get into shopping for a boy, I can remember doing that when I was a kid. I can't remember where we sent the toy, I think it was somewhere in the US, probably Appalachia. Thanks for sharing I am going to look into doing this! Usually we gift a gift through our church during the holidays but this seems like a great program to reach children whom really need it!! I've done this in the past and it is so much fun shopping for little ones..trying to find toys that will fit in the box..Samaritan's Purse is a very worthwhile project! We do shop for children but we have a tree where you pick a mitten and buy a gift for those in our community. I vote for two boxes . . and hope your boys begin to think about their mystery friend all year long. Golly, I'm glad to know you . . . This is such a lovely idea! I laughed when I read about the boys preference. I'm happy to be back for now let's just hope I can make it! I'm in my woe frame now...LOL! Thanks for visiting good hearing from you! I love this! I think it's something we need to do this year! I don't actually but do fill the trollies that run the charity runs..and knit smaller items and scarves all year long to give to a friend who dispenses the items. I like this shoebox idea a lot though. I like shopping for girls! I think it's awesome that you are doing this and that the boys are learning about giving of themselves at their early age. Wonderful! We usually support the USMC Toys for Tots campaign. Here they put a Christmas tree in Walmart. On the branches are little cut out construction paper stars, each with "boy" or "girl" written on them. You pick an ornament off, then you buy toys from Walmart (it's not entirely altruistic) and the toys get delivered to the school for distribution. The Sheriff's Department runs it. For myself, I always contribute to the Marine's Toys for Tots campaign. That's really cool! I'll have to look into doing that. Always, yes! We take brand new coats to the domestic violence shelter too because I know those moms leave home in a hurry sometimes. 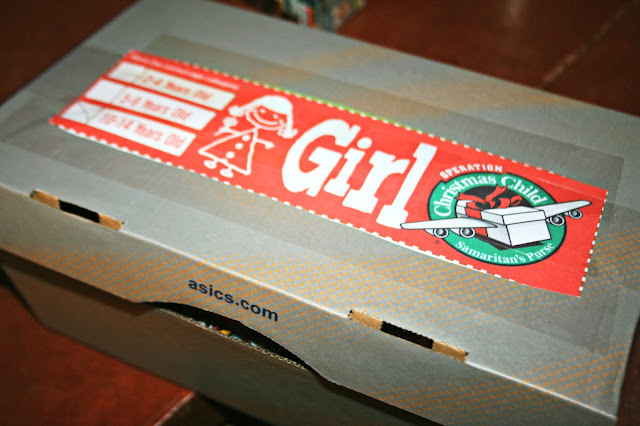 I love the shoe box idea!! Our church has never participated in this, but our family dos it every year. Anne Marie loves doing the shopping. You really did good this year! Well, looks like you will just have to do a boy next year, change it up for once. It will give the boys a real kick! I always love to give to the Marines Toys for Tots drive and have fun looking for items for that. I usually give books along with a toy or two because I believe in reading. Every year we get the name of a local child, and shop for them-and I've also helped out through Samaritan's Purse-an excellent organization! I have seen this and know a lot of people who do it - I think having boys - shopping for a girl would be fun. I saw the picture that is was for a girl and I thought "oh I bet the boys had fun shopping for a girl" but I guess I was wrong! I sent a donation for boxes this year. We always send off 3 boy shoeboxes, buy livestock for family via Heifer International and cut a hefty check to our local Salvation Army. I figured it out last year, we spend as much on charitable giving as we do on actual gifts for people, including the Santa presents. That is such a sweet thing to do. I love how you teach your boys to help out others! This is a nice idea in the spirit of Christmas. I've never filled a box with gifts but I've drawn a name and gotten a gift for that child. Beautiful collection of the toys! sounds like as a little stall. We have a giving tree in our shopping centre. You take a card with an age and boy/girl marked on it. I do love giving at Christmas. We give every year to kids in need....and I try to also give to seniors in need. Giving is definitely better than receiving. I bet the boys would be great shoppers for the boy box! We use to do Samaritan Purse gift boxes also when our children at home. That reminds me I need to get to packing, packing, packing! I usually pack 3 shoeboxes every year. I buy things on clearance throughout the year and I have some leftovers from years past because if I find a really good deal I'll buy 10 or more if the price is right. I like to put in a few post cards that showcase West Virginia! :) One year I actually got a sweet letter from the family who received one of our boxes! I was going to say it is smart of you to buy for a girl that way the boys won't want what you bought! lol I guess I'll be packing my boxes tomorrow! I've actually never shopped for someone else during holidays, but I make sure I do my good deeds throughout the year. But not a bad idea, so I might look into that!